With all the rain we are now enjoying thick, green grass and bright flowers. 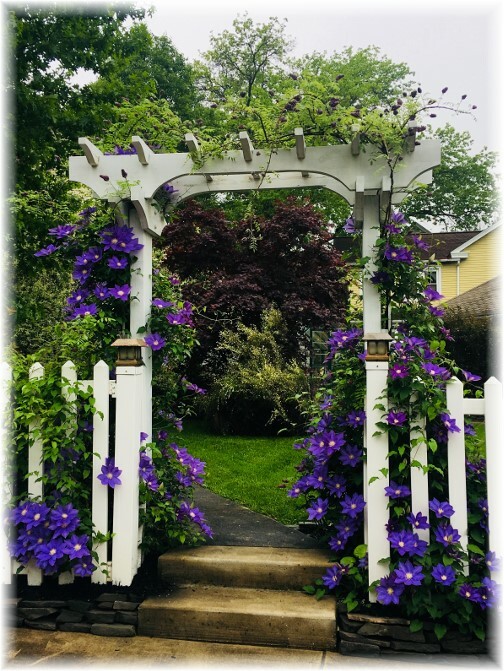 Ester took this photo of a purple clematis in Mount Joy late Saturday afternoon. It was a bright view following days of pouring rain though the sun was not yet shining at the time. Message summary: Today we urge all our readers to consider again the simple call to Peter and to all of us to “Follow Me”. Make it your resolve for this to a be a lifelong pursuit. “Come, follow Me” (Matthew 4:19). “You must follow Me” (John 21:22). “To this you were called, because Christ suffered for you, leaving you an example, that you should follow in His steps” (1 Peter 2:21). Friday afternoon as I was walking through a company for a chaplain visit I received a call from James, a bright eleven year old and deep thinker who’s already gifted in the art of conversation. He asked if I could take him and his older brother to an animal sale at the Green Dragon, a huge weekly auction here in Lancaster County. I was unable to do so since I had other commitments but we talked for a few minutes. They were going to buy some pheasants (not to be confused with peasants!). 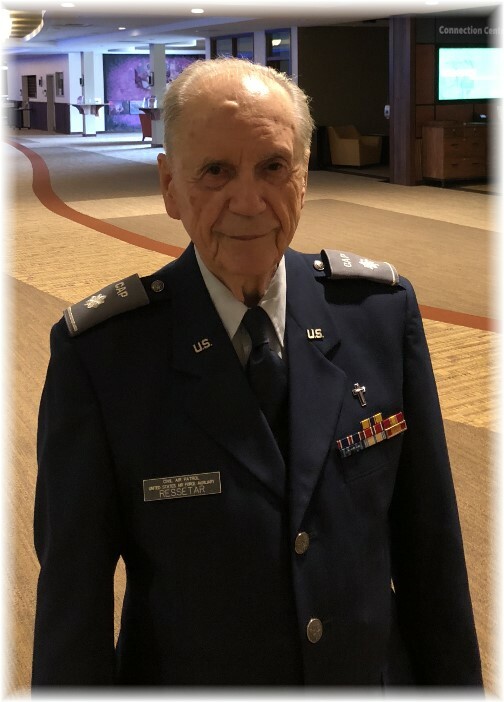 James is being raised in the ways of the Lord and, as our conversation concluded, I asked him, “Are you going to stay faithful to the Lord all your life?” He responded with an affirmative, “Yes”. He then asked me a very thoughtful question. “Does anyone ever tell you they’re not going to stay faithful?” I paused but a moment and answered that I never had anyone tell me they were planning to be unfaithful. Sadly though, as life progressed, there are those who have not remained faithful in following the Lord, though they indicated that they would. I shared with James that I hope, years from now when he’s older and worldly temptations are beckoning, that the Spirit would bring to remembrance our conversation and it would be a source of encouragement and reminder for him to stay faithful. I can think of such conversations and experiences from my past that have given me residual encouragement. If you stop to think about it, you surely can as well! Perhaps that was the case for Peter in his last recorded personal conversation with Christ before He ascended back to the Father. That conversation is our second daily text, “You must follow me”. Many years later Peter could draw on this personal teaching from the Lord to encourage him when the going got tough, as it surely did for Peter, as he stood firmly in his faith, even in the face of persecution. Interestingly the first recorded words that Peter heard from Jesus directed personally to him were, “Come, follow Me” (Matthew 4:19a). 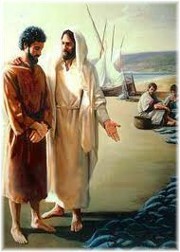 And the last recorded personal words to Peter from Jesus were, “You must follow Me” (John 21:22). What a clear message to Peter and to all of us who are called to be His disciples! “Come, follow Me” remains the supreme call of Christ to each of us from the beginning of life to the very end. Many years later when Peter was writing his epistles he again recalled this call to follow and writes, “You should follow in His steps” (1 Peter 2:21). Following in His steps, we should “walk, even as He walked” (1 John 2:6). Charles Sheldon wanted to attract local college students to God, so he began preaching a series of practical Sunday evening sermons on how to follow “in His steps”; in business, in journalism, in other careers. From the popular series he wrote magazine articles, which in time became the best-selling book, “In His Steps”. 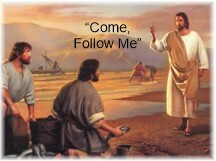 Today we urge all our readers to consider again the simple call Jesus made to Peter and to all of us; “Follow Me”. Make it your resolve for this to a be a lifelong pursuit. Daily prayer: Faithful Jesus, help me to determine in my heart that Your words, “Follow Me” will far surpass the importance of any other mission I undertake in my lifetime. I pray that my goals, achievements, and ambitions never conflict with the major calling You have placed on my life. Lord, may all that I pursue establish for me a firm foundation where my faith will grow so that I bring glory to Your name, both in life and in death. Amen. Saturday morning started out with pouring rain, but it let up by early afternoon. 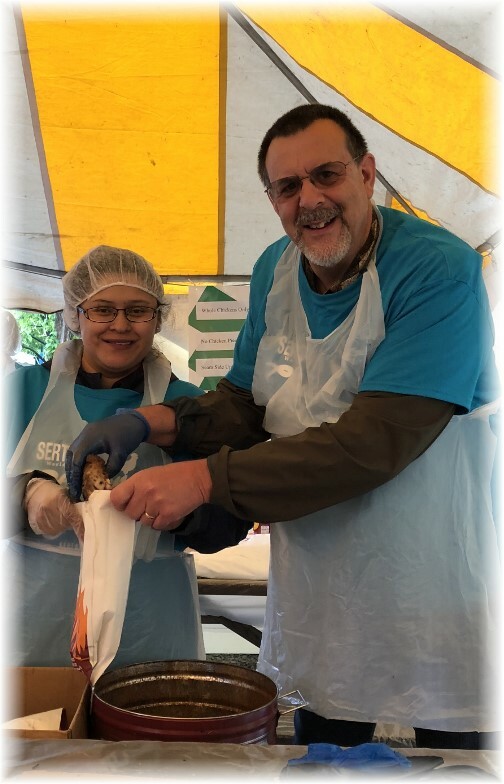 Ester and Stephen volunteered at the 66th Annual Sertoma Chicken BBQ event in Lancaster. 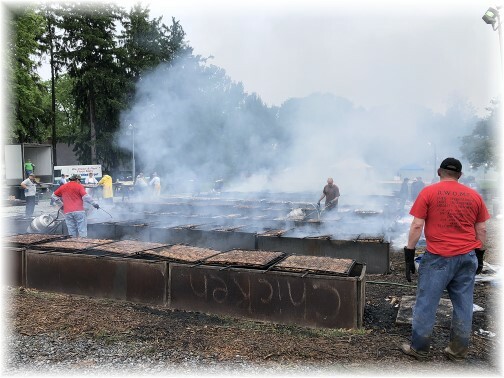 They packed over 500 bags of 1/2 chickens for what is billed as the world’s largest chicken bbq. According to reports the Sertoma Chicken BBQ serve some 24,000 chicken bbq dinners. A scene of the grilling action at the Sertoma chicken bbq on Saturday. While Stephen and Ester worked I was being blessed and even pampered! I was invited to participate in the “Day of Blessing” at our church, an event to honor Caregivers such as moms raising a special needs child, wives caring for their dependent spouse, etc. I had volunteered to serve but instead was asked to be among those who received. This photo shows the “Blessing of the Hands”. As music was being played on the piano and the “Blessing of the Hands” prayer was being read two leaders stood at a table and poured water over our hands while praying for us and the need we had shared. 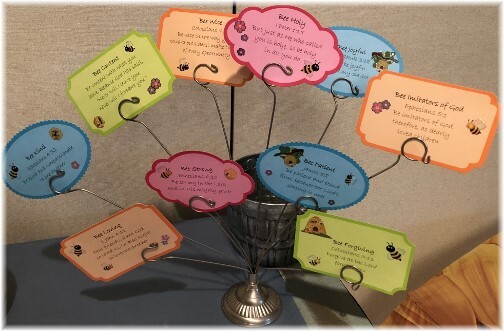 This was the tenth year for “Day of Blessing” and their theme was “Sweet as Honeycomb” based on Psalm 119:103. 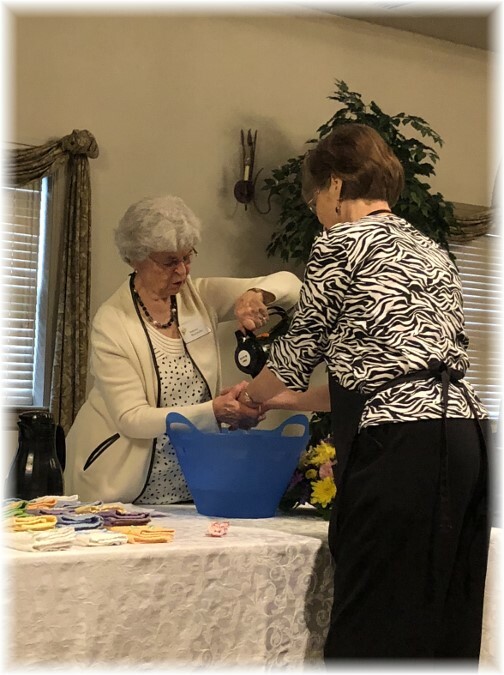 Following our time of singing, devotions and Blessing of the Hands we enjoyed lunch, made some crafts and were pampered with our choices of haircut, manicure, pedicure, chair massage, special session of prayer, etc. The best part of all was getting acquainted with other caregivers responsible for their loved ones such as spouses whose husbands have Parkinson’s disease, mothers raising autistic children, those caring for a family member permanently injured in an accident. Their stories touched me deeply. The day spent with these precious caregivers reminded me that each of us is given a unique opportunity to serve others as we serve the Lord. A close-up of the Clematis that Ester took on late Saturday afternoon. Ours are blooming as well but aren’t as far along as these beauties. 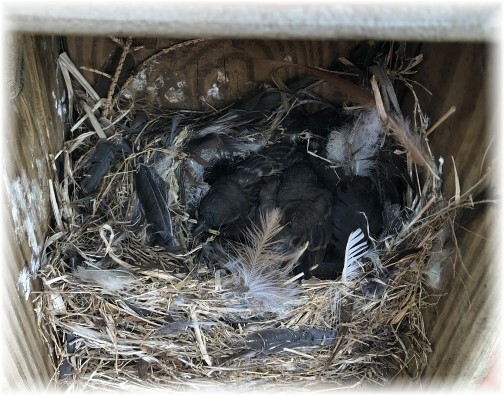 Yesterday afternoon we were sitting out on our back deck when we noticed the side had fallen off our birdhouse requiring an emergency repair, though the birds nestled together inside their nest, did not seem distressed at all.